The awkward trappings of this Disney adventure mechanize and blunt the tale's humanity. It pops and squeaks and rumbles, but Treasure Planet lacks the strength to transport audiences. 95 min. Walt Disney Pictures. Directors: John Musker, Ron Clements. Cast: Joseph Gordon-Levitt, Brian Murray, Emma Thompson, David Hyde Pierce, Martin Short. 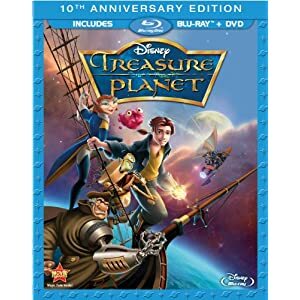 At one point in Disney's animated revamp of Robert Louis Stevenson's Treasure Island—dubbed Treasure Planet to fit an intergalactic milieu—one of the characters comments, "No tricks. Just a little palaver." Younger kids may wish for more of the former and less of the latter in this sometimes clever but all-too-often crushing enterprise. Here, young adventurer Jim Hawkins (voice of Joseph Gordon-Levitt) chafes against his grounded, fatherless existence, but resignedly cleans up around his mother's inn until he finds himself in possession of a much-sought-after treasure map. To chase the treasure, Jim's humorously double-talking family friend (David Hyde Pierce) hires a ship captained by feline Amelia (Emma Thompson) and manned by a suspiciously scurvy bunch. Chief among them is a cyborg Long John Silver (Brian Murray), a dark and imposing figure who's one montage away from a soft heart and a paternal gleam. The action alternates between amusing but talky banter destined to make kids restless and high-gear action that fails to generate rooting interest or suspense in seen-it-all-before adults. In design and action, Treasure Planet comes too close to Fox's then-recent Titan A.E. for comfort. A space-squall sequence meant to capture the windblown, dangerous fury of an ocean voyage plays more like a digital-animation demo reel than an advancement of the story. Screenwriters shorthand Hawkins even more sketchily than usual, suggesting that his teen age might have been a fatal blow to a genuine sense of wonder. Atlantis, though similarly clunky, at least endowed its hero with a sturdier emotional investment. Not a bad movie, Treasure Planet earns the faint praise of the damned, along with the assured approval of plenty of indiscriminate kids. The film meets the generally high standard of Disney's feature animation, but suffers from a clash of visual elements, some dingy and some hotly colorful. The liveliest voice work belongs to Emma Thompson, Pierce, and latecoming Martin Short, whose manic robot B.E.N. occasionally evokes his fatuous Jiminy Glick. Unfortunately, no one character or sequence stands out as endearing or indelible enough to qualify Treasure Planet for the timeless Disney pantheon. In the end, animated science fiction fails to enhance Stevenson's story; rather, the awkward trappings of this Disney adventure mechanize and blunt the tale's humanity. It pops and squeaks and rumbles, but Treasure Planet lacks the strength to transport audiences. Disney's Blu-ray + DVD 10th Anniversary Edition of Treasure Planet provides a strong hi-def upgrade that doesn't let down this flashy title. Clean, razor-sharp, and eye-catching with its warm hues and fast-moving action sequences, this hi-def transfer leaves nothing to be desired, while the DTS-HD Master Audio 5.1 surround mix goes toe-to-toe with the visuals, proving substantial immersion and rumbling LFE to bring the audience right in the midst of the thrills. This release rounds up the substantial bonus features from its previous issue (in serious need of some "Play All" options), kicked off by the “Introduction by Laurie Metcalf” (0:57, SD) with the actress holding court from the Walt Disney Feature Animation Studios in Burbank, and as found in the audio menu, a detailed filmmakers' audio commentary with producer Roy Conli, co-directors/co-writers John Musker and Ron Clements, and supervising animators Glen Keane, John Ripa and Ian Gooding. “Disney’s Animation Magic: Hosted by Roy Disney” (14:18, SD) offers a “private guided tour” of the Disney Feature Animation Studios. Three "Deleted Scenes" (6:33, SD) come with introductions by Metcalf and Musker & Clements. The Story section serves up another "Introduction by Laurie Metcalf" (1:01, SD), followed by the 1950 Disney "Treasure Island Trailer" (2:08, SD), while Music presents an "Introduction by Laurie Metcalf" (1:38, SD) and the “'I’m Still Here (Jim’s Theme)' Music Video performed by John Rzeznik of The Goo Goo Dolls” (4:13, SD). Art Design includes "Introduction by Laurie Metcalf" (0:48, SD), “The Bandywine School” (2:24, SD), “The 70/30 Law” (1:39, SD), and The Characters includes "Introduction by Laurie Metcalf" (0:59, SD), “John Silver: The “Hook” Test” (1:00, SD), “John Silver: Silver Arm Test” (0:37, SD), “B.E.N. : Introduction by Laurie Metcalf” (0:48, SD), “B.E.N. : 3D Character/2D World” (1:05, SD) and “Maquettes” (3:11, SD). Animation comprises "Introduction by Laurie Metcalf" (1:13, SD), “Delbert Doppler” (1:09, SD), “Silver Progression Animation” (2:25, SD), “Pencil Animation: Amelia‘s Cabin” (2:10, SD), “Rough Animation to Final Film Comparison” (1:38, SD), while Dimensional Staging includes "Introduction by Laurie Metcalf" (1:08, SD), “Effects Animation” (1:19, SD), “Pose Camera” (1:42, SD), “Layout Demonstrations” (1:23, SD), “Treasure Planet Found” (2:08, SD) and “Lighting” (1:12, SD). Lastly, Release collects "Introduction by Laurie Metcalf" (0:35, SD), the "Teaser Trailer" (1:24, SD) and the "Theatrical Trailer" (2:22, SD). All site content © 2000-2019 Peter Canavese. Page generated at 04/17/2019 03:53:22PM.